For the first time in more than a quarter-century a new space vehicle stands ready in NASA's Kennedy Space Center Vehicle Assembly Building. The Ares I-X rocket, its simulated crew module and launch abort system are assembled on a mobile launch platform at Kennedy in preparation for launch this fall. 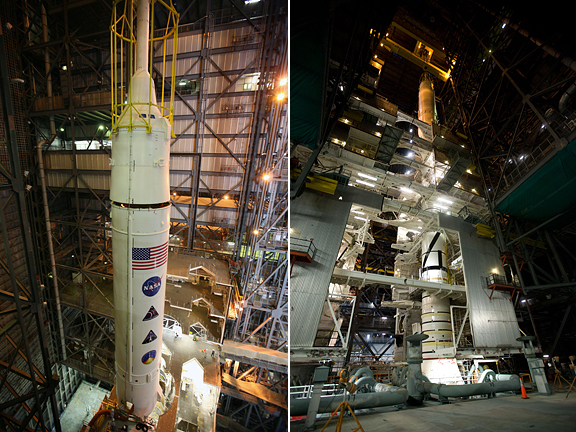 The final segments of the Ares I-X were stacked on Aug. 13, completing the 327-foot launch vehicle and providing the first look at the finished rocket's distinctive shape. The Ares I-X flight test is targeted for Oct. 31. "More than three years of hard work with the NASA and contractor team has brought us to this historic moment," said Bob Ess, Ares I-X mission manager. "This flight test is a critical step in continuing our design process for the Ares vehicle and the first flight for the Constellation Program." The Ares I-X is wired with more than 700 sensors to gather data during the two-and-a-half minute flight test. The launch will provide NASA an early opportunity to test and prove hardware, facilities and ground operations associated with the Ares I crew launch vehicle. The data collected during the launch will allow NASA to gather critical data during ascent of the integrated Orion spacecraft and the Ares I rocket. Now that the Ares I-X is assembled, numerous evaluations will be run on all the rocket systems, including complex instruments that will constantly measure the vehicle's movements as it launches and the first stage separates. The evaluations include a process called "modal testing," which will shake the stack slightly to test stiffness of the rocket, including the pinned and bolted joints.